Do you have a case involving a patient who developed a serious wound, loss of function, or even endured an amputation as a result of an infusion therapy complication? Infusion Therapy solutions and medications are meant to be delivered through an intravenous (IV) catheter which is placed in a vein. However, there are instances when either the vein ruptures or the IV catheter becomes dislodged from the vein. When this happens, IV solutions and medications which are meant to infuse through the vein now leak into the tissue surrounding the vein. The leakage of this fluid into the tissue surrounding the vein is called either an infiltration or extravasation injury. What is the difference, you ask? Both an infiltration and extravasation involve an IV solution or medication being delivered into the tissue surrounding the vein instead of into the vein itself. It is the type of solution or medication which is inadvertently delivered into the surrounding tissue that determines whether this infusion therapy complication is called an infiltration or an extravasation. According to the Intravenous Nursing 2011 Standards of Care, when an IV solution or medication that can cause localized ischemia (decreased blood flow and oxygen delivery to a specific area) or localized necrosis (the absence of blood flow and oxygen that results in skin and underlying tissue death at a specific area) is leaked into the area surrounding the veins, it is called an extravasation. 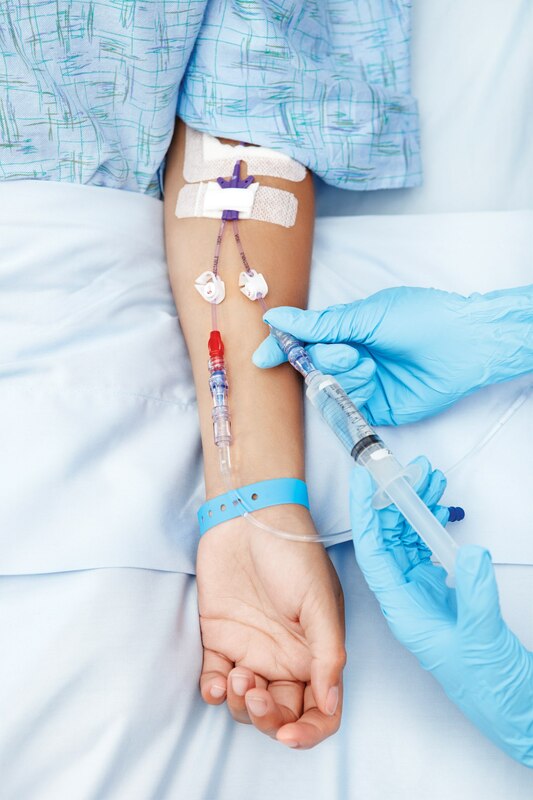 When an IV solution or medication that will not cause tissue ischemia or necrosis is inadvertently administered outside of the vein, this infusion therapy complication is called an infiltration. 1. Vesicants are IV solutions and medications that cause ischemia and necrosis. Vesicants are extremely acidic or basic (pH less than 5 or greater than 9), hyperosmolar (extremely concentrated), or vasoconstrictive (cause the blood vessels to constrict). Many chemotherapy drugs are vesicants. Vasopressors – medications that cause the blood vessels to constrict and result in a subsequent rise in blood pressure. Vasopressors are most often used when treating critically ill patients to help maintain an adequate blood pressure through the vasoconstriction of the blood vessels. Examples of vasopressors include norepinephrine (Levophed), phenylephrine, (Neo-Synephrine), epinephrine, dopamine, dobutamine, and vasopressin. 2. Non-vesicants are IV solutions and medication that do not cause ischemia or necrosis. When skin and underlying tissue necrosis develops, a surgeon may need to cut out (debride) the necrotic (dead) tissue in order for healing to occur. If a large area needs to be debrided, a skin graft may be necessary to close the wound. A skin graft is a procedure in which a surgeon removes healthy skin from one part of the patient’s body (the donor site) and attaches the healthy skin over the area where the necrotic tissue was removed. Although rare, IV extravasation injuries may lead to amputation; these most serious complications usually occur when treatment is delayed. Valarie Haisley is a certified wound care nurse expert working with Med League. Contact Valarie to discuss your cases involving wound care and/or infusion therapy complications. Med League provides highly-qualified IV therapy experts as well as wound care experts who can review your case. U.S. Market for Vascular Access Devices and Accessories. Data Research Inc. 2013.174. Walls MC, McGrail M, Webster J, et al. Risk Factors for peripheral intravenous catheter failure: a multivariate analysis of data from a randomized controlled trial. Infect Control Hosp. Epidemiol. 2014; 35(1): 63-68. Smart infusion pumps…an answer to medication errors? Nursing negligence or ineffective technique?